On behalf of the Board of Directors, I am pleased to provide you with an update on the Presidential Search process. John Carroll University is a great institution and deserves the very best president. We have contacted many highly sought after leaders in higher education, all of whom currently hold senior leadership positions and have proven their ability to perform. We developed the position profile, and began the search based on community feedback through emails, surveys, and listening sessions. We have convinced presidents, provosts, deans, nonprofit leaders, and others, who are happily and successfully engaged in their positions elsewhere to consider John Carroll University. We learned quickly that the world of higher education leadership is exceedingly competitive, and the stakes are too high if the name of a successful individual gets out. We were told candidly — and from the outset — that our top candidates would never agree to be in the pool unless they could do so without risk of public knowledge. We know that other Jesuit universities have recently conducted closed searches for their president, and even public universities are moving away from open searches in order to attract the best talent. We realized that we would not attract sitting presidents to the search, and in fact, we would lose about 50% of our current pool of candidates. We debated the value of an open search. It was hard for the Presidential Search Committee to imagine a highly successful senior leader at another university informing their board, their academic colleagues, alumni, donors, and others that they are seeking the presidency at John Carroll University. These candidates could be working with significant donors who could decide not to produce a large gift if the person in whom they developed trust is likely not to be there to shepherd it. Open searches live on the Internet forever. If a candidate is not chosen, it haunts them in every other career move, and their campus will know that they were in our search. Open searches attract people who have been fired from their previous jobs, or people who have fulfilled their roles and their boards or institutions have agreed that they can be on the job market. For these reasons, we will conduct a Hybrid Closed Search. In the coming weeks, the Presidential Search Committee will meet with the semi-finalists to narrow the list to a group of finalists. The 3-5 finalists will meet with the Presidential Search Committee and the Feedback Group on October 27, November 2, November 10, November 29 or December 1. All finalists will go through the same vetting process. Last week, the Board of Directors met for our regular fall meeting and decided to add two additional faculty members to the Feedback Group for a total of four (4) members of the faculty. I am appointing Dr. Emily Butler (Chair of Faculty Council) as one of the four faculty members on the Feedback Group. The remaining three (3) faculty members will be appointed after consultation with Dr. Barbara D’Ambrosia and Dr. Ed Hahnenberg (members of the Presidential Search Committee), and Dr. Butler. All members of the Feedback Group will be asked to sign confidentiality agreements; participate in the finalist interview schedule outlined below; and submit a written assessment of any finalist via online survey for the Presidential Search Committee to review. I hope this level of detail about our process is helpful. If you have further questions about the Presidential Search please refer to our presidential search website, email me at boardchair@jcu.edu, or direct your questions or concerns to a member of the Presidential Search Committee. Thank you for your support in this important process for John Carroll University. On behalf of the Board of Directors of John Carroll University, I am pleased to provide an update on the Presidential Search process. Since early June 2017, the Presidential Search Committee has been meeting with our executive search firm, Isaacson, Miller, to review nominations and candidates for our next University President. Our goal is to complete a successful search over the next few months so that we are able to announce our next University President early in 2018. As you know, we conducted a series of listening sessions with our community in April and May 2017. In addition to the listening sessions, the Presidential Search Committee has been meeting with representatives from Isaacson, Miller all summer. On May 15, 2017, the Committee met to review the process and timeline. We discussed the challenges, opportunities, and objectives for the position. We drafted the position profile, and collected important University documents to aid the search process. In early June 2017, Isaacson, Miller conducted listening sessions with appropriate constituents and stakeholders to learn more about the University and to solicit nominations and candidates. The position profile was completed and launched on June 13, 2017, and active recruitment began. We have searched strategically and broadly for our next University President. Isaacson, Miller has tapped into their large network of professionals in order to source candidates. We reached out to more than 623 senior leaders of Jesuit, Catholic, and both public and private universities, including 37 JCU alumni serving in leadership positions at Jesuit and Catholic institutions. We announced our search for new leadership in national higher education publications including the Chronicle of Higher Education, Diverse Issues, Hispanic Outlook, and Women in Higher Education. We posted online ads with the Association of Jesuit Colleges and Universities (A.J.C.U. ), and the Association of Catholic Colleges and Universities (A.C.C.&U.) to broaden our candidate pool. We reminded ourselves that John Carroll University is part of a prestigious network of 28 Jesuit colleges and universities in the United States including Boston College, Georgetown, and Loyola Chicago. We also know that the leadership of these prestigious institutions has changed dramatically since we last searched for a University President more than a decade ago. Today, only 46% are led by Jesuits. The majority, 54%, are led by lay leaders (11 men and 4 women) as noted on theAJCU website. We engaged in conversations with the Jesuit community in the United States and Canada for guidance. We had direct outreach to the President of the Jesuit Conference of the United States and Canada, The Very Reverend Tim Kesicki, S.J., who is a graduate of JCU and former member of the JCU Board of Directors. We spoke with the Provincial of the USA Midwest Province of the Society of Jesus, Very Rev. Brian G. Paulson, S.J., who serves as the leader of John Carroll University’s regional Jesuit Community. The President of the Association of Jesuit Colleges and University, Rev. Michael J. Sheeran, S.J., was a tremendous resource. JCU is a member of the AJCU and Fr. Sheeran serves on the JCU Board of Directors and chairs the Committee on Academic Affairs. We strategized with the Rector of our Jesuit Community, Very Rev. Martin Connell, S.J., who is a member of our faculty and serves on the Presidential Search Committee. We engaged the Jesuit members of the JCU Board of Directors for nominations. However, we did not limit our outreach to only the Jesuit network. All summer we networked and screened more than 511 possible candidates coming from a range of private and public institutions. Isaacson, Miller provided regular reports about the progress of the search and sought input from the Presidential Search Committee. On August 8, 2017, the Presidential Search Committee met for four hours to review the first presentation of candidates by Isaacson, Miller. We discussed the recruitment of individuals, reviewed nominations, and debated applications. By the end of that meeting, we had narrowed the pool down to 35 possible candidates. Following that meeting, Isaacson, Miller interviewed candidates of continued interest one-on-one to share impressions and make recommendations for our next search committee meeting. They also reached out to an additional group of individuals who had been recently nominated. The second presentation of candidates took place on September 6, 2017. Isaacson, Miller met with the Presidential Search Committee for more than four hours to discuss the current pool of candidates and identify a list of 8-10 semi-finalists we wish to meet in person. Between October 2-11, 2017, the Presidential Search Committee will meet with those semi-finalists in order to narrow the list down to our top finalists. At that point, Isaacson, Miller will conduct extensive reference and background checks on any finalist in order to report findings to the Presidential Search Committee and to the JCU Board of Directors. 511 individuals were sourced directly by Isaacson, Miller through personal outreach, phone calls, and emails. Of this group, 100 individuals declined to be a candidate, and 62 gave referrals of other possible candidates, which were followed up with immediately. 33 individuals were interviewed by phone or video to create the first cut of a pool of candidates that best fit the needs of the University. 14 nominations were received through various channels like the JCU website, the Isaacson, Miller website, or via email or phone calls directly to me. These individuals were added to the candidate pool noted above for follow up. 56 Jesuits in higher education leadership positions were contacted directly to either recruit them to become a candidate or refer a candidate. Of this group, we had in depth conversations with 20 Jesuits to identify the best pool of candidates. 35 individuals were reviewed by the Presidential Search Committee on August 8, 2017. Isaacson, Miller then conducted additional follow up to confirm ongoing interest and to secure more formal applications of candidates. Of that group of 35, 13 individuals were discussed in detail by the Presidential Search Committee and Isaacson, Miller during our meeting on September 6, 2017. Of that group of 13, 8 individuals have been selected for in-person interviews by the Presidential Search Committee during the month of October in order to identify finalists for more in-depth interviews. When the Presidential Search Committee narrows the group down to 3-5 finalists, we intend to conduct two-day interviews with them off campus and not introduce them publicly to the University community. During these last few months, the Presidential Search Committee discussed the confidentiality of the search process at great length with representatives from Isaacson, Miller. Early on in our process, it became very clear that the top candidates will withdraw from our search if their names are shared beyond the Presidential Search Committee. It could jeopardize their career or hurt their home institution if they are known to be included in our search. Therefore, the group of 3-5 finalists will not be shared publicly with the University community. Our search process will be a “hybrid” closed search, which has been followed by other private universities, including several Jesuit universities. This “hybrid” closed search means that we will create a feedback group for the Presidential Search Committee to engage a few more members of our community. As I noted above, the Presidential Search Committee has discussed informing our community about the need for confidentiality in order to attract the best candidates for President, and that we would not be having campus wide meetings for the 3-5 finalists in order to respect their confidentiality. In order to gather more feedback about each finalist, the Presidential Search Committee will seek input from an additional 12-14 people who would make themselves available to meet each of the finalists over several different dates in late October and November. These additional 12-14 individuals must sign confidentiality agreements identical to the agreements signed by each member of the Presidential Search Committee. They must agree to participate in all of the finalist interviews. They cannot participate in just one of the interviews, and they cannot send a substitute. As you can imagine, scheduling this Feedback Group along with the Presidential Search Committee will be a challenge for the 27-33 people involved including the 3-5 finalists still to be selected. As a reminder, we created a presidential search website that includes information on the general timeline, the committee, the position profile, the University, and other important updates. It is available through this link. You can email me with questions about our process and I will review and respond as needed. That email address is boardchair@jcu.edu. On behalf of the Board of Directors of John Carroll University and the PresidentialSearch Committee, I am pleased to announce that Isaacson, Miller has been selected to assist the university’s search for its 25th president. The new president will succeed Rev. Robert L. Niehoff, S.J., who announced his plans to retire on June 1, 2017, at which time he will become President Emeritus. On June 1, 2017, Dr. Jeanne Colleran, Provost and Academic Vice President at John Carroll, will become Interim President. Isaacson, Miller is the nation’s largest higher education executive search firm focused on mission-driven organizations. They have recruited leaders for the following outstanding Jesuit Catholic institutions, including Loyola University Chicago, University of San Francisco, Creighton University, College of the Holy Cross, Scranton University, and Xavier University. They have also recruited for some of the nation’s most prestigious colleges and universities, including Dartmouth College, Bowdoin College, Duke University, Smith College, Spelman College, Miami University, Howard University, Hamline University, the University of Dayton, Bellarmine University, Sacred Heart University, and St. John’s University. Objectives for the new president: What do you want the new president to accomplish? What are the desired outcomes for the role and for the University? How will you know in three to five years that the right person was hired? What will have happened? Qualifications and experience: Based on the objectives identified, what do you think are the qualifications and experience of an ideal candidate? What is essential and what might be helpful? Personal qualities: What are the personal attributes most important for this role? Source and candidate recommendations: Finally, who should the searchfirm contact in the outreach to identify candidates? Obviously, they will draw upon their own networks, but they want to tap into ours as well. This certainly means suggestions of possible candidates, but just as important, suggestions of good sources who might lead to strong candidates. Once the search firm has had an opportunity to meet with us, they will synthesize all that they have learned from our interviews and from our institutional material. Important aspects of what they learn will be included in the position profile, and will also be helpful as they have discussions with potential candidates. What they learn will enable them to offer the Presidential Search Committee advice when they are preparing to interview individuals and as they evaluate their skills and expertise. As previously announced, the Presidential Search Committee, includes representation from a wide variety of university constituents including students, faculty, staff, alumni, and the administration, as follows: Michael J. Merriman ’78 (Chair) along with the following members of the University Board of Directors: William P. Donnelly ’83; Evelyn Jenkins Gunn, PhD ‘72G; Teresa Kluesener Lewandowski ’78; David M. O’Brien ’72; David W. Short ’81. They are joined by the Rector of our Jesuit community, Fr. Martin Connell, S.J. PhD; an elected faculty member, Barbara D’Ambrosia, PhD; an appointed faculty member, Ed Hahnenberg, PhD; a staff council representative, Lisa Brown Cornelius; a student, Zachary Thomas ’18; and a member of the senior leadership team, Doreen Knapp Riley. I will continue to provide updates as the search process unfolds. In the meantime, please try to attend the meetings with Michael Baer, Vice President, and Pam Pezzoli, Managing Associate, with Isaacson, Miller next week. If you have suggestions or questions please email me at boardchair@jcu.edu. On behalf of the Board of Directors of John Carroll University, I want to express our gratitude to the students, faculty, and staff that participated in the presidential searchcampus listening sessions last week. Your candid suggestions, questions, and reflections about the desired characteristics, opportunities and challenges for our next President made a powerful impression on the members of the Board of Directors who were able to attend the listening sessions. I promised to keep you informed of our progress on the search. Profession: Retired Executive Vice President, Highmark, Inc.
Presidential Search Committee members will be expected to commit to a timeline and meet certain expectations including attending meetings and candidate interviews; participating in discussions that relate to the identification of priorities and personal and professional attributes sought in the next president; reviewing candidate applications; identifying a short list of candidates for interviews; participating in interviews and identifying candidates to be invited as finalists; and summarizing for the Board of Directors the individual strengths, relevant experiences and concerns for each finalist. We are creating a presidential search website which will include information on the process, the committee, the position profile, the University, and an online suggestion box. University constituents will be invited to submit suggestions and preferences for John Carroll’s next leader. The website will launch in early June. We have created a new email address for me for this process as we expect many suggestions and questions over the next year. That email address is boardchair@jcu.edu, which I will review and respond as needed. Search Committee meeting with search firm to discuss process, position profile, meeting schedule, etc. Search Committee meeting for an update on candidates with the search firm to determine who to invite to interview later in the semester. I encourage the John Carroll students, faculty, staff, alumni, parents, donors and community leaders to participate in this important presidential process by offering feedback and insights as the search moves forward. Please try to participate in as many campus meetings as possible. If you have suggestions please email me at boardchair@jcu.edu. Thank you in advance for your support in this important process for John Carroll University. As you know, the Board of Directors asked me to serve as Interim President next year. The Board Chair, Michael Merriman, is assembling the Presidential Search Committee, and he and other Board Members will come to campus on May 3rd to engage the University community in a discussion of what skills and qualities are needed in the next President. A reminder of the schedule of Mr. Merriman’s visit will be forthcoming. The hope is to identify the next President within the next academic year so that he or she may start as soon as possible. Mr. Merriman and others are committed to finding an excellent candidate, and they are in the process of deciding which search firm to use. I begin as Interim President on June 1. For the past two years, the Vice Presidents for Student Affairs and Mission and Identity have reported to the Provost. After June 1, those positions will report to the Interim President as will the yet-to-be named Associate Vice President for Enrollment. Also reporting to the Interim President are the Chief Financial Officer, the Vice President for Advancement, and Legal Counsel. I have asked Dr. Nicholas Santilli to serve as Interim Provost and Academic Vice President. We have an established protocol for selecting a permanent Provost and/or Academic Vice President that will be shared with the new President. This protocol will be used when a national search for a new Provost is undertaken. Reporting to Dr. Santilli will be the two Academic Deans and the Director of the Library, the Assistant Provost for Advising, and the Registrar. I have asked Dr. Todd Bruce to take over Nick’s duties by serving as Assistant Provost for Institutional Effectiveness and Assessment. Ms. Cynthia Schwartz will now report to Todd. Dr. James Krukones has agreed to work with the Directors of the three signature programs (Arrupe, Leadership, and Honors). I am grateful to all those who have been willing to accept changed and additional responsibility during this transitional time. I pledge our strongest effort to preserve high standards of both academic excellence and institutional performance. Thank you for your patience as these changes are sorted through, and please contact me with any questions you have. I write today to inform you about the process and status of the search for the next president of John Carroll University. As you know, Fr. Robert L. Niehoff, S.J., announced last month his intention to retire. As stated, Fr. Niehoff offered to stay on for an indefinite period of time until we found the next president. After further conversations with the Board of Directors, Fr. Niehoff offered to step down after this academic year on June 1, 2017. He did not want to influence the search process and thought it would be best for the Board to work directly with the in-place leadership team at John Carroll. The Board has elected Fr. Niehoff to President Emeritus status effective June 1. In this new role, Fr. Niehoff will make himself available to consult with me and to participate in alumni activities. On behalf of the Board, I want to thank Fr. Niehoff for his 12 years of leadership and accomplishments at John Carroll. He brought a passion and affection for the university, our students, faculty, staff, alumni and donors. We look forward to continuing our relationship with him in the years to come. The Board of Directors has appointed Dr. Jeanne Colleran, Provost and Academic Vice President, to serve as Interim President, effective June 1, 2017. Her extensive knowledge of John Carroll will enable us to strategically advance the university. Since August 2014, Dr. Colleran has led several key initiatives including the creation and implementation of the University’s Strategic Plan: Promise and Prominence 2015-2020; the new integrative core curriculum; and the launch of several new academic programs. She is a 1976 graduate of John Carroll University and completed her doctorate in English at The Ohio State University. She served as Chair of the English Department and as Dean of the College of Arts and Sciences. Dr. Colleran will serve as Interim President until the Board of Directors elects the 25th president of John Carroll University. No Board decision is more important than hiring a president. While we expect to spend the 2017-2018 academic year conducting the search, we are launching the process immediately. The presidential search process will positively engage the campus community, highlight our strengths and values, and successfully transition us into the next generation of leadership. Higher education is undergoing a dramatic transformation about value, affordability, and quality. 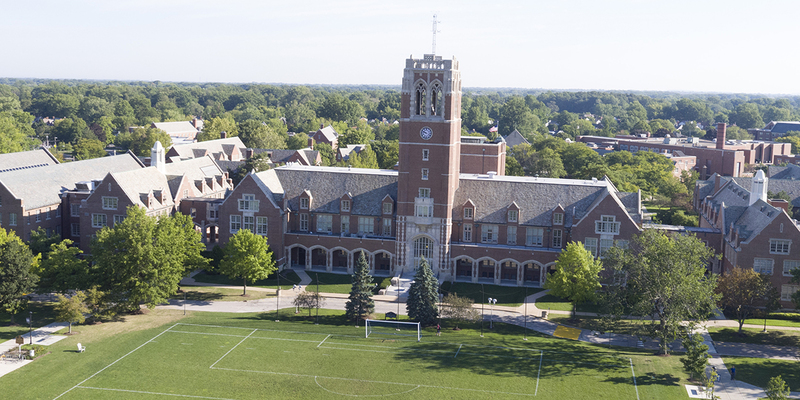 We seek a strategic leader who will guide the university on a growth path by building upon our distinctive programs, faculty teaching and research and our community and academic partnerships, while embracing our Jesuit Catholic mission. We will begin with the formation of a search committee and selection of an executive search firm in the next few weeks. In early May, the Board will conduct a series of listening sessions to engage the campus community about the criteria for the next president, which will lead to the development of a position profile. The presidential search committee should be in place by the end of April 2017 with broad representation from the Board, faculty, staff, students, and alumni. We will use your input from the listening sessions to refine a position profile to be used by the executive search firm to recruit candidates. This profile will articulate the qualities, skills and experience necessary for the next president to be successful, as well as the opportunities and challenges at John Carroll University. Since the environment for presidential searches has changed substantially over the past decade, we will be searching in a highly competitive market for the most qualified candidates. The Board of Directors will select an executive search firm at the May Board Retreat on May 17, 2017, based on proposals from AGB Search; Isaacson Miller; Park Square, and Witt Kieffer. Our goal is to identify candidates during the fall of 2017, and to select the next president before August 2018. I express our commitment to act with integrity and in the best interest of the University and all of our stakeholders. As the search process unfolds, I will send updates to the University community about our progress. In the interim, I encourage you to attend the appropriate Campus Listening Session on May 3. On behalf of the Board of Directors, I thank you for your trust and commitment to the future success of John Carroll University. Today I informed the Board of Directors of John Carroll University that I am planning to retire as president. I am willing to work with the Board during the search for the new president, which will begin immediately. I have been thinking for some time about the ideal time to position the University for new leadership. This year has been exceptional and full of hard rewarding work. With the Higher Learning Commission’s recent reaffirmation of our accreditation status; the successful conclusion of the Forever Carroll comprehensive campaign; the launch of our new strategic plan; growing recognition and prestige for our accountancy and science programs; and achieving national media coverage for beating Mt. Union in football for the first time in 27 years, it became clear to me that the time for me to retire is now. It has been an honor to serve as your president since August 2005. I have been humbled to work with some of the most talented and committed faculty and staff members I have ever known. Our Board of Directors is engaged, strategic and committed to making Carroll better. I am forever grateful to those who have made leading John Carroll University more rewarding than one could imagine, and I could not be more proud of all that we have accomplished together—exceptional student learning, preparing our graduates to lead and live lives of inspired service. As I reflect on my 12 years as president, I am grateful to have been able to share my passion for Carroll students at more than 700 lunches or dinners with donors, sharing our priorities and a vision for a better future for the University building upon the great work that our faculty and staff do every day. Many of you know that I came to John Carroll because of our graduates. I am enormously grateful to have gotten to know our talented campus community and so many loyal and committed alumni. Support for Carroll is stronger than ever, and we are on track for another record year of donations. Personally, it has been most rewarding and gratifying to get to know our students. I have enjoyed seeing our students grow and evolve. They continue to amaze me with their commitment, passion, and dedication to scholarly work and service. I have seen students transformed here, young people who came to us as freshmen and then went on to graduate ready to lead and serve. I have seen the University dramatically improve the four-year graduation rate for talented high need students. I have been able to join our students at dozens of Masses and retreats, and it is always a highlight and grace for me to pray with them. And, it is hard to imagine that I have signed the diplomas of, and personally shook the hands of, more than 10,000 John Carroll graduates. This is not a farewell message; but it is a signal that change is forthcoming as it does for all organizations. I believe that if we can begin the presidential leadership search now, a new leader can be in place and position the University for long-term success. I know that you join me in our desire to strengthen the University for future generations, and I am grateful for all you have accomplished to help put us on this path. The Board of Directors will soon engage our community regarding the search process to help select my successor. Thank you for your dedication to John Carroll University. With God’s grace, may we continue to serve our students, and support one another in our unique Jesuit Catholic mission. Blessings to each one of you in these last weeks of the academic year. I look forward to being with you at our numerous end of the year campus events.